AUT and University of Auckland students take out 2012 Microsoft Imagine Cup Team Mobile Eye wins the opportunity to represent New Zealand at Worldwide Finals in July. Team Mobile Eye, with students from both AUT and the University of Auckland, has won the 2012 Microsoft Imagine Cup, impressing the judges with their innovative project that aims to provide assistance to blind New Zealanders. 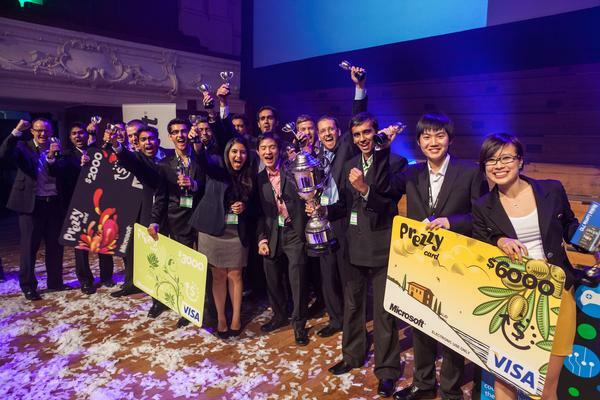 The team was one of 16 teams in action at the Auckland Town Hall last night, competing in the New Zealand final of the world's premier student technology competition, the Microsoft Imagine Cup. "This year was an extremely exciting and intense competition with more than 400 entries - the most New Zealand entries to date," says Scott Wylie, Director of the Developer and Platform Group for Microsoft New Zealand. "Team Mobile Eye stood out with their imagination, passion, creativity and a well thought out solution to address the issues faced by people who are blind. The team now is now aiming for the Worldwide Finals and we expect the international judges will be very impressed with this New Zealand team's work." The team will now have the chance to represent New Zealand at the Worldwide Finals in Sydney this July. "We are so excited about winning here tonight. It proves our idea is solid and all the hard work we have put in has paid off," says Aakash Polra, Team Leader for Team Mobile Eye. "We wouldn't have been able to do this without the support of our mentors, Microsoft, our family and friends, and others in the industry - so thank you to them. We are thrilled to be going to the Worldwide Finals to represent New Zealand and hope to bring home the Cup for the first time." New Zealand has performed well in previous years, with teams from the University of Auckland finishing in the top six at the Worldwide Finals the last two years running, with Team One Beep coming third globally in 2010. "The Imagine Cup provided us with a great opportunity to think about education and health needs in developing countries, and use technology to solve these issues. To be raising awareness of these issues, as students, has been a great experience," says Kayo Lakadia, of Team One Beep and Team One Buzz - the teams that represented New Zealand at the last two Worldwide Finals. "As a result of participating in the competition we've been able to meet with some of the world's wealthiest and most influential people, including Bill Gates and Steve Ballmer. We are now in a position where Microsoft New Zealand and the ICEHOUSE have helped us take our ideas further and turn our project into a reality." The Microsoft Imagine Cup is the world's largest technology competition, challenging students from around the globe to develop technologies that help solve the world's toughest problems. Now in its 10th year, it is a truly global competition with more than 358,000 students from 183 countries participating. The other top three finishing teams were: Second Place - Team Thought-Wired from the University of Auckland with their solution NOUS which empowers individuals with severe physical disabilities to communicate and interact. Third Place - Team Aura from the University of Auckland with their modular solution that detects abnormal breathing patterns and could revolutionise the diagnosis of Obstructive Sleep Apnea. Fourth Place - Team Connect from the University of Auckland with a communication system that responds immediately following a disaster, keeping you connected to loved ones. To coincide with the Worldwide Imagine Cup Finals, Datacom will award an Imagine Cup scholarship, offering one participant the choice of a paid six-month internship, or a three-month holiday internship and three months mentoring in Datacom's Microsoft Enterprise & Mid-Market Solutions team. Students can apply at www.datacom.co.nz.